Its long-time performance venue may have changed (gone from the Tsai Center), but in its new digs in Watertown, Boston Midsummer Opera under the musical direction of Susan Davenny Wyner, continues to charm—this summer with two operas by Italian composers who have operas (or at least an opera) ever-present on the world’s stages. This season opens up horizons with two charmers that are all but unknown, effectively staged and gloriously sung. The Mosesian Theater in the Arsenal Center for the Arts is a comfortable compact space with substantial free parking (there is no T service, but city buses should make it fairly accessible) It probably seats fewer people than the Tsai Center at Boston University, used in previous summers. This is a shame, because the operas, which have further performances on Friday, July 22, and Sunday, July 24, should attract a large number of opera lovers (the place was packed on opening night). The two operas come from about 50 years apart, hence from different ends of the mainstream tradition of Italian opera. Unsurprisingly, considering the marketing title, “Love, Italian Style,” and the general tenor of operatic works, the main subject matter involves different aspects of love. But here no rabidly jealous husbands brandish knives with intent to slay either an unfaithful wife or her recently-discovered lover. No, even when jealousy may arise for cause, a comical solution ensues. Both operas have been slightly trimmed, and the orchestrations have been reduced, probably to cut expenses and also to fit the players into constrained area upstage. Conducter Davenny Wyner made use of all her operatic savvy and wiles (as a former singer with considerable stage experience, and now with some years as a conductor) to block the action. They could only see her in a monitor behind the audience, and one wonders how she could see the singers, so she needed to intuit their breathing and vocal attacks, which, in fact, she did extremely well. Though ensemble was not perfectly tight, especially in the liveliest passages, it worked very well on the whole. Gaetano Donizetti’s Il Campanello (“The Bell”) is a light-hearted comedy with about the specific gravity of one of P.G. Wodehouse’s Jeeves and Wooster stories. An attractive young woman is about to marry an elderly, but wealthy, apothecary, who is constrained by a new law to answer the night bell at all times, in order to fill urgent prescriptions. The bride was previously the girlfriend of a cousin, who finds a way to get a little revenge—comical , but not mortal. During the wedding night he repeatedly rings the bell and appears in a series of different disguises, calling for different accents and vocal styles, ordering elaborate and absurd concoctions. When dawn arrives, the frantic apothecary, not having consummated his marriage, must leave (as we learn earlier) on a business trip to Rome. There could hardly be a simpler plot, but the two essential characters—bass Jason Budd as the long-suffering apothecary, and baritone David Kravitz as the wonderfully imaginative ex-lover—make it work very well. There are other characters with smaller parts who appear at the beginning and ending, but the heart of the opera unfolds during the long night with three different comical disturbances from the night bell. Given how essential the words are to understanding this comedy, Il Campanello was sung in an effective translation by Ruth Martin, who did wonders particularly with the final ludicrous prescription, outlined in a patter song as topsy-turvy as anything in Gilbert and Sullivan. Meredith Hansen, the new bride, appeared suitably sweet and charming in the next largest part, and her mother, Madama Rosa, was taken by mezzo Britt Brown. Stefan Barner impersonated the long-suffering butler, Spiridione. A small chorus of wedding guests (Rachele Schmiege, Erica Petrocelli, Stephanie Scarcella, Stefan Barner, Sean Lair, and Seth Grondin) played their cheerful (and well sung) supporting role at the beginning for the wedding party and, more surprisingly, when they returned at the crack of dawn to hustle the frenzied apothecary to the train. Donizetti, one of the masters of bel canto opera, the style that dominated in Italy especially in the second to fourth decades of the 19th century, composed Il Campanello in 1836. Mascagni’s L’Amico Fritz, came just after he achieved instant fame with Cavalleria Rusticana in 1891—a half-century after the Donizetti work. But that half century had been dominated by the dramatic genius of Giuseppe Verdi, whose works increasingly called for a different kind of singing, often forceful and full volume (even on the high notes, which in the bel canto period were produced with less “muscle.” It seemed unlikely to find cast able to sing in both these styles in a double bill, but in fact, most of the principals and all of the choristers and secondaries did just that. L’Amico Fritz (“My Friend Fritz”) tells a rather surprisingly calm story for an opera composed by a man associated with the passion and the violent murder in his first opera. Mascagni apparently determined to move in a different direction with this one, and he sought long and hard for a suitable new property. The 1864 novel L’Ami Fritz by Erckmann Chatrian (the pseudonym of two French writers, created by simply combining their two surnames) inspired by their native region, Alsace-Lorrain. 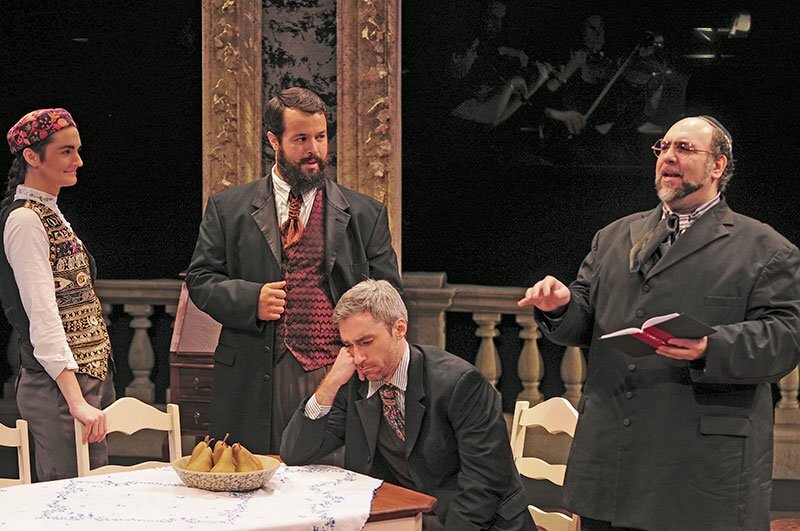 Though it is not made explicit in the opera, the region of the story is a happy place filled with contented people representing a wide range of religions, including Catholic, Protestant, and Jewish, living in harmony. This explains the significance of Rabbi David (a very rare type for European opera, [though one thinks of Zaccaria in Nabucco and Eléazar in La Juive as semi-rabbinical]). He is a good friend of the wealthy landholder Fritz Kobus, who enjoys his wealth and social activities with his male friends, but who has decided never to marry. Not that he is against marriage in principle; he often supplies the dowry for some impoverished girl or another to make it possible for her to marry respectably. David has been something of a matchmaker in local weddings, and he makes a bet that before long Fritz will also choose to wed.
That is the set-up, and the remainder of the opera unfolds with utter lyricism. No arguments, no battles, no brawls, no deaths. Just a gradual realization by Fritz that he is in love with Suzel, the daughter of one of his tenant farmers. He resists thoughts of marriage as long as he can, but eventually David essentially tricks him into a confession of his own denial by implying that Suzel is about to be married off to another man. 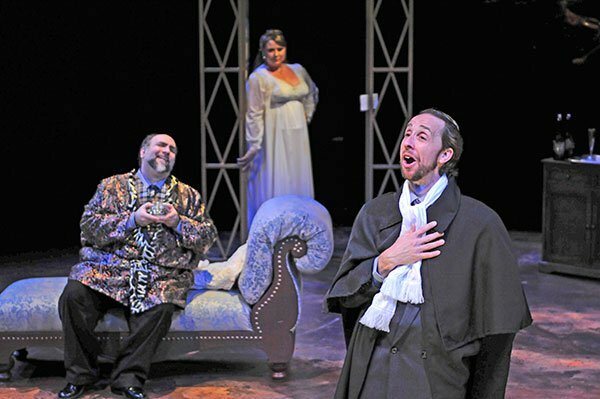 Three vocal parts carry supreme importance here: Fritz, sung richly and forcefully by tenor Matthew Vickers; Suzel, imbued with elegant lyric grace and growing passion by Meredith Hansen; and Rabbi David, intoned by Jason Budd with both playfulness and intensity Britt Brown played the surprising “pants role” for a mezzo playing a man, Beppe, the gypsy musician. Stefan Barner and Seth Grondin, and his housekeeper by Erica Petrocelli performed as Fritz’s bachelor friends. An offstage chorus part was somewhat abridged, mainly to allow it to sing a motto central to the work: “If you allow love to get away, it may not come back.” This half of the evening played in Italian with supertitles, because the original language simply works better with Mascagni’s urgent, flowing vocal lines. Throughout the evening the simple sets designed by Stephen Dobay were full of character, and Elisabetta Polito’s costumes contributed greatly to the effect. Stage director Antonio Ocampo Guzman, who has worked with Susan Davenny Wyner on several earlier productions, kept the action lightly comic in Il Campanello and more naturalistic in L’Amico Fritz. But the main reason to see this pair of operas, aside from the simple matter of enjoying a night in the theater with two rarely heard pieces by favorite composers, is the very high quality of the singing throughout, which both enlivens the humorous quality of Donizetti’s work and supports the warmly lyric character of Mascagni’s. “Love, Italian Style” will repeat Friday night at 7:30 pm and Sunday afternoon at 3:00. Pre-performance talks by Richard Dyer come one hour earlier.